The number of foreign visitors visiting Turkey in 2015 decreased only slightly compared to tourist numbers for 2014, despite terrorist attacks targeting the country's stability, along with threats and crises from the surrounding region. According to data compiled by state-run Anadolu Agency (AA) and figures from the Ministry of Culture and Tourism, 36.2 million tourists visited Turkey in 2015, marking just a 1.61 percent decrease compared to 2014. 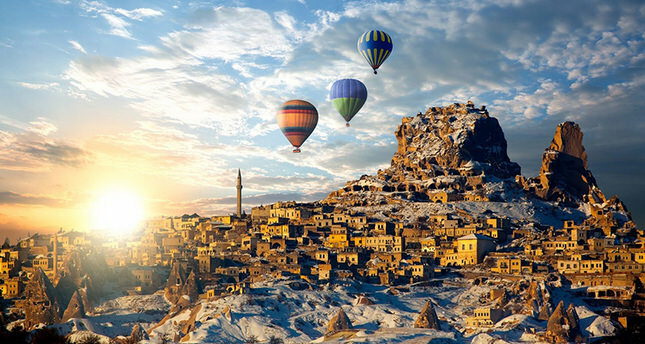 Following a pattern established over the previous two years, the largest number of tourists to Turkey from a single country were Germans with 5.6 million, an increase of 330,000 visitors over the numbers for 2014. The number of German tourists visiting Turkey has increased by nearly 10 percent since 2013. German tourists are thus important to Turkey's tourism sector and economy, and this helps to explain why German nationals were deliberately targeted in the suicide bombing that took place on Jan. 12 in Istanbul's landmark Sultan Ahmet Square, where 11 elderly Germans were killed. Russians and British tourists followed Germans with approximately 3.6 million and 2.5 million visitors, respectively. The total number of visitors decreased by 593,000 compared to 2014. Analysts blame this drop on deterioration in the Russian economy and the renewal of armed clashes between Turkish security forces and the PKK terror organization in southeastern Turkey. The decline in tourist revenues was greater than the decline in tourist numbers, due to the weakness of the Turkish lira relative to the dollar and euro, marked by an 8.3 percent decrease for a total of $31.464 billion. Of this revenue, 81.3 percent came from foreign visitors spending an average of $756, while the rest was from Turkish ex-patriates, spending an average of $970. The number of visitors from Russia is expected to continue decline due to ongoing tensions between Russia and Turkey, after the Nov. 24 incident in which Turkish F-16 jets downed a Russian Su-24 bomber for violating Turkey's airspace. Moscow has implemented sanctions on Turkish goods and refused work permits for Turkish workers, and the Russian government has also called on its citizens to not travel to Turkey, despite the attraction of its warm beaches. The number of Russian tourists visiting Turkey plunged 46.9 percent in December 2015, dropping to 25,485 in December 2015 from 47,954 in the same month of 2014. However, the number of tourists visiting Turkey from more than 40 other countries increased in 2015, including major markets like China and the U.S., along with Iran, from where many more visitors are expected as the Iranian economy should benefit from the lifting of nuclear sanctions. Istanbul was the main gateway for foreign tourists with 12.4 million arrivals in 2015, followed by Antalya with 10.9 million, Edirne with 3.2 million, Muğla with 2.9 million and Artvin with 2 million.